Buy Diffuser Necklace Australia | Aromatherapy Jewellery Sale! SPECIAL OFFER: Essential Oil Diffuser Pendant & Chain Set! HomeSPECIAL OFFER: Essential Oil Diffuser Pendant & Chain Set! Enjoy the soothing aromas of your favourite essential oils wherever you go with this stylish ‘Tree of Life’ aromatherapy diffuser necklace! The magnetic diffuser pendant (25mm) is made from 100% surgical stainless steel to so it is easy to clean, will never tarnish, and can last forever. It also comes with an adjustable 50cm stainless steel chain and 8 reusable felt pads (inserts). 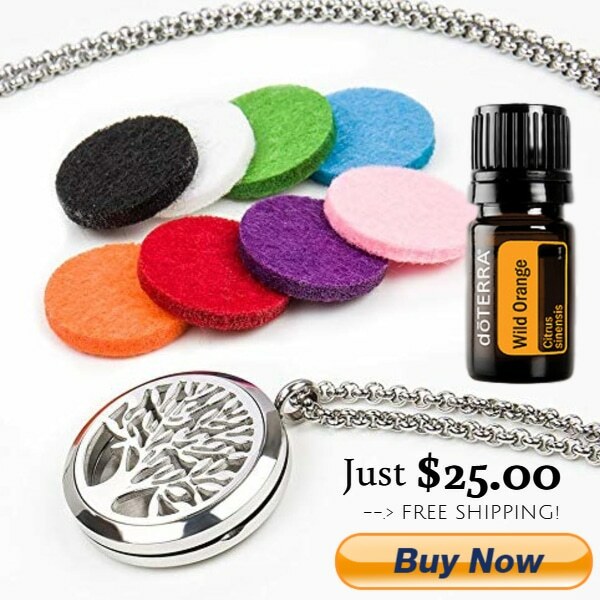 Take advantage of our special offer and buy your diffuser pendant and chain set for just $25 and for a limited time you’ll also receive a FREE 5ml bottle of doTERRA’s divine Wild Orange pure essential oil. doTERRA’s Wild Orange is such a wonderfully uplifting, “happy” aromatic oil that will support you during your busy day. PLUS, for a strictly limited time you’ll also get FREE SHIPPING. Hurry, this special offer is closing soon!